Morocco have failed to meet the deadline to confirm it will host the 2015 Africa Cup of Nations in January. The North Africans had requested a postponement because of fears over the Ebola outbreak. The Confederation of African Football (Caf) refused the request and set a deadline of 8 November for Morocco to confirm they would host the tournament. The deadline was also given to any countries who may want to step in as replacement hosts. A statement from Morocco's sports ministry said: "Morocco maintains its request to postpone the CAN 2015 to 2016. "The decision is dictated by health reasons because of the serious threat of Ebola and the risk of its spreading." Sierra Leone has suspended all football matches in the country. Caf has placed bans on Guinea, Liberia and Sierra Leone hosting any international football. Seychelles forfeited their Nations Cup qualifier rather than host Sierra Leone. A judgement on the future of the 2015 tournament is set to be made on 11 November when Caf has an executive committee meeting in Cairo. Morocco, which last staged the finals in 1988 and which will host Fifa's Club World Cup next month, had asked for the 16-team tournament to take place in either June 2015 or January 2016. However, Caf's executive committee unanimously agreed to maintain the dates of next year's competition - which is scheduled to run between 17 January and 8 February. 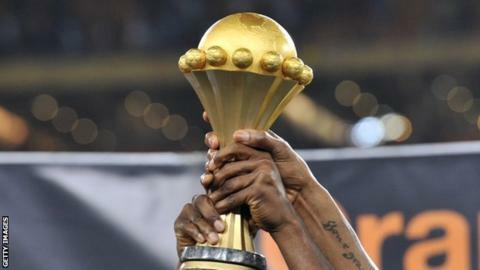 "We will never take any risk if we are unsure about whether a competition poses a threat to the hosts," Caf secretary-general Hicham El Amrani told BBC Sport on Tuesday. "That would be as disastrous for us as for any nation having the virus." El Amrani said that consultation with the World Health Organisation (WHO) had been key to the rejection of Morocco's request. Algeria - Last hosted the event in 1990 but reportedly had a meeting with Caf officials at the African Champions League final last week. There are concerns about the crowd violence that led to the death of JS Kabylie striker Albert Ebosse in August. Angola - Hosts in 2010 and would therefore have the infrastructure and stadiums in place to step in at late notice. Egypt - The six-time winners were hosts in 2006 but the North African nation has recently suffered from political unrest. Gabon - Co-hosts with Equatorial Guinea in 2012 and with South Africa ruling themselves out of the running they are the nation who most recently held the event. Nigeria - The reigning champions co-hosted with Ghana in 2000. They officially opened their new Akwa Ibom International Stadium in Uyo on Friday.